Home Executive Compensation What Are the Components of Executive Compensation? Many organizations, especially large ones, administer executive compensation somewhat differently than compensation for lower-level employees. An executive typically is someone in the top two levels of an organization, such as Chief Executive Officer (CEO), President, or Senior Vice-President. 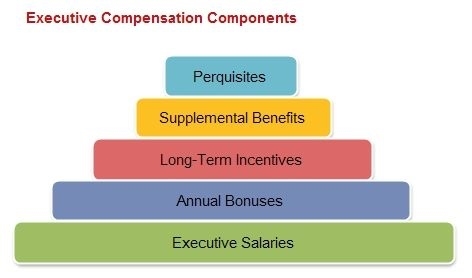 As Figure shows, the common components of executive compensation are salaries, annual bonuses, long-term incentives, supplemental benefits, and perquisites.